In April of 1945, during the final days of the European theater and with the approaching rumble of Soviet tanks heralding the collapse of his "Thousand Year Reich", Adolf Hitler is said to have committed suicide within his Berlin bunker. His longtime mistress Eva Braun also joined him in death, rather than be captured alive. They took cyanide and then shot themselves. And according to surviving accounts, Hitler's aides took the bodies outside the bunker, doused them with gasoline and set them ablaze: an attempt to ensure that the Soviets could not make a trophy of the Fuhrer's remains. 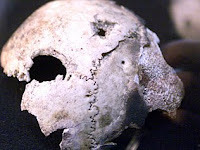 But a year later, bones and skull fragments with bullet holes were found at the site by Russian forces. They were assumed to be all that was left of Adolf Hitler. The fragments sat in Moscow throughout the Cold War, and only in recent years have they finally come under the scrutiny of modern science. And now, according to DNA studies... "Hitler's skull" is found to be that of a woman, most likely between the age of 20 and 40. There's no telling who this skull might be then. My guess is that it might be Braun's, but absent any confirming DNA from possible relatives, there's no way we'll ever know. Just one more mystery then, among the myriad of enigmas, of World War II. But it also adds fuel to the fire about persistent theories that Hitler survived long after the war. Or, maybe it really is Hitler's skull... and he was actually a woman? I've heard that one in my time too. I knew it! Hitler was really a chick with bad PMS! It explains EVERYTHING!